Grab your jersey and get your “game face” on! It’s time for Super Bowl XLIX, He Hunts She Cooks Style. Even though the Steelers aren’t in the Super Bowl this year, it’s still a great reason to party. 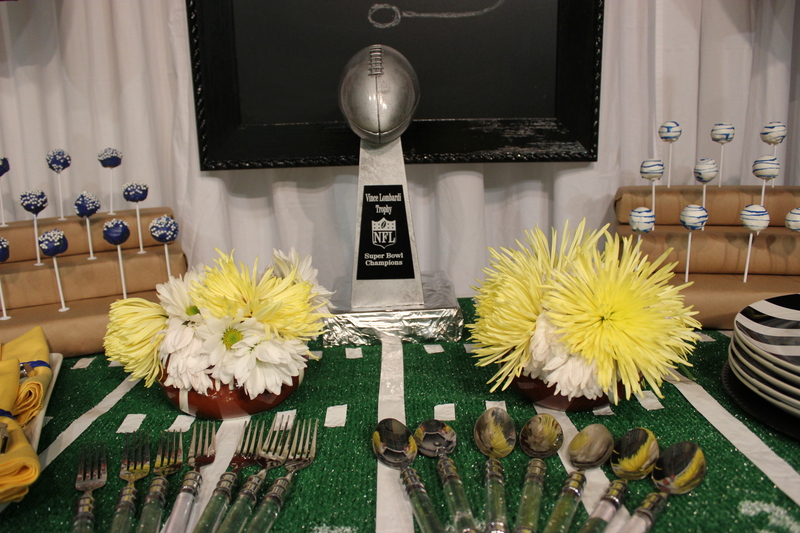 I’ve created a mini version of a tablescape you can re-create in your own home to bring life to your Super Bowl party. With a trip to your local hardware store, and Ikea, this table is a cinch to set up. Danny was re-living his glory days when he pulled out his old high school football play book, and drew a Veer 28 Quick Pass Right. Al Bundy would be proud! We started with a scrap piece of plywood, cut 72″ x 32″. He placed it over three saw horses. The table can be made any size you want, but we just used what we had available. Then we bought a roll of indoor/outdoor turf at Home Depot and cut it to fit, and used the extra for the floor. Then Danny measured out the yard lines and tapped them off with white Duck Tape. For the yard numbers, I used a number stencil and some white paint and dabbed it over the stencils. 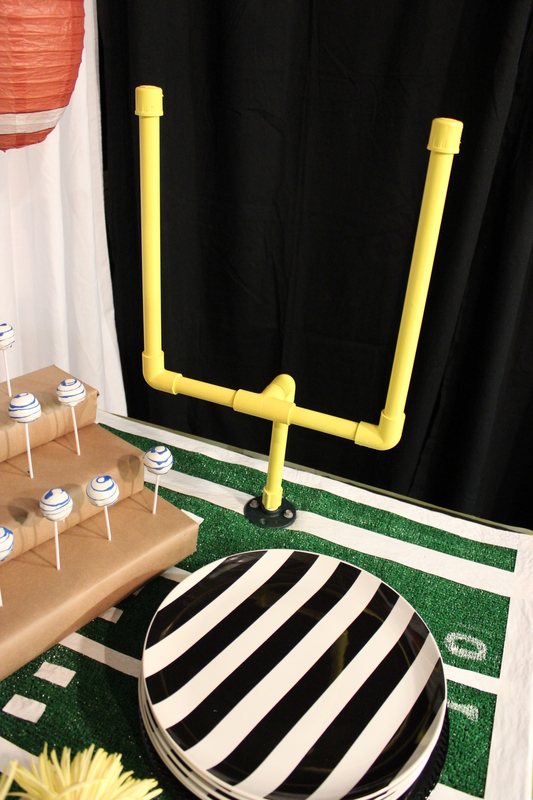 The goal posts were simply made from 1/2″ pvc pipe, a few elbows and T connectors. Then anchored to the table with metal anchor fittings. A few coats of yellow spray paint and they were all done. 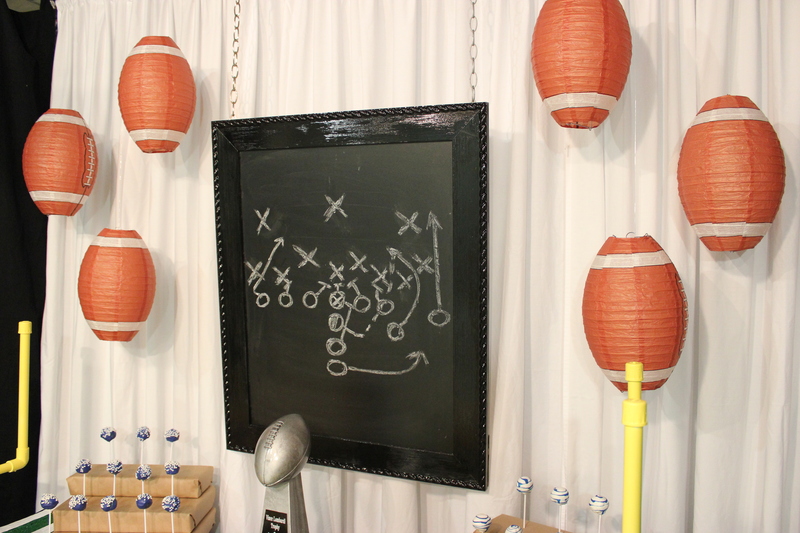 I purchased a chalkboard in a frame from Homegoods ($35), and Danny drew the football play on it, and we hung it from chain. This chalkboard is also used for other tablescapes and holiday decorating. The 14″ Lombardi “trophy” was a cool find on Amazon ($70) and engraved for free. We added a generic engraving so it can be used every year. I found small ceramic football candy/flower vases on Amazon ($13/each), and just added some simple white daisies, and a yellow mums. If you don’t want to use flowers, you could substitute some nuts or candy. Black table cloths were tacked around the table, and I added white fabric strips on the front to mimic referee stripes, and also to break up the black. 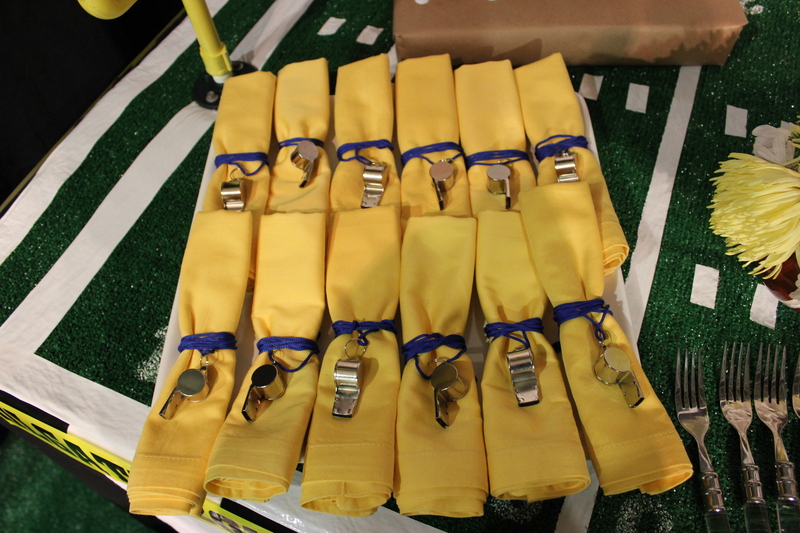 I have bright yellow cotton napkins that reminded me of penalty flags, and I used a pack of whistles from Oriental Trading to wrap around them. 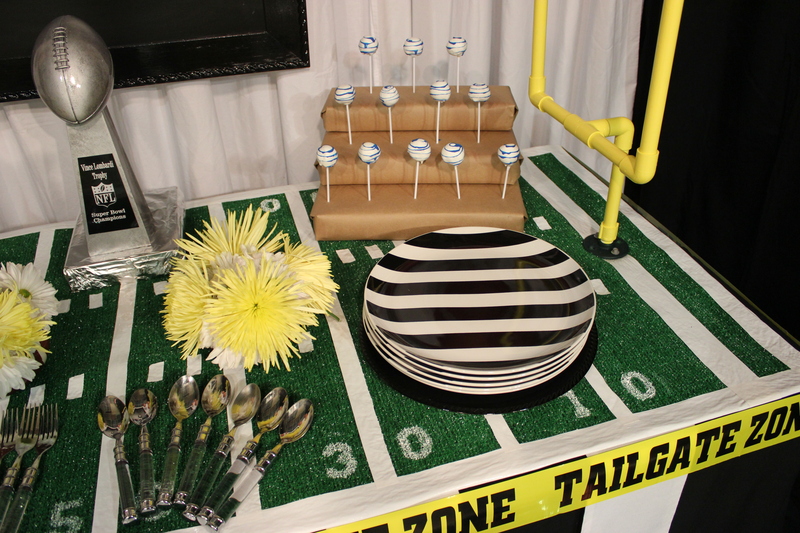 For the cake pops, we used some styrofoam wrapped with shipping paper to mimic fans in the stands. The black and white 12″ ceramic plates were an awesome find at Ikea ($4.99/each) in Emeryville, Ca. They are called “Tickar.” They reminded me of a Ref’s shirt. They are quite heavy and perfect to load up with lots of nachos, wings or whatever you’re munching on!!! 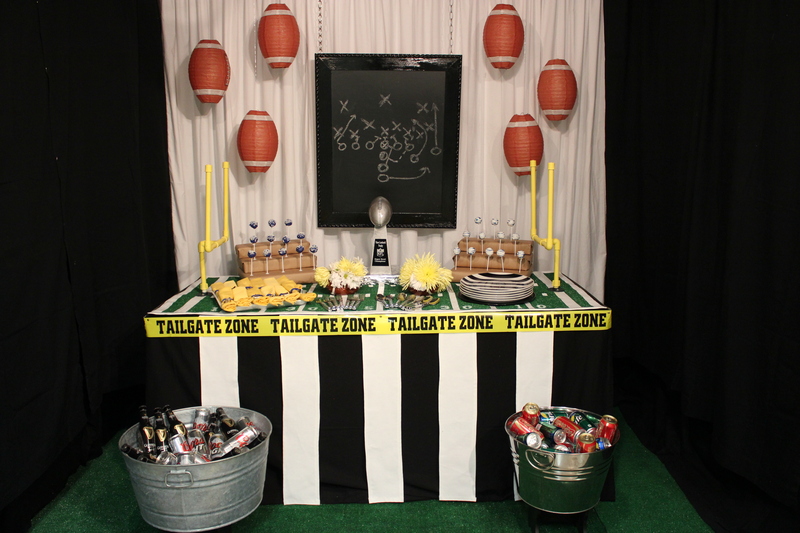 A few paper football lanterns from Oriental Trading and yellow “tailgate tape” finished out this simple, festive table. 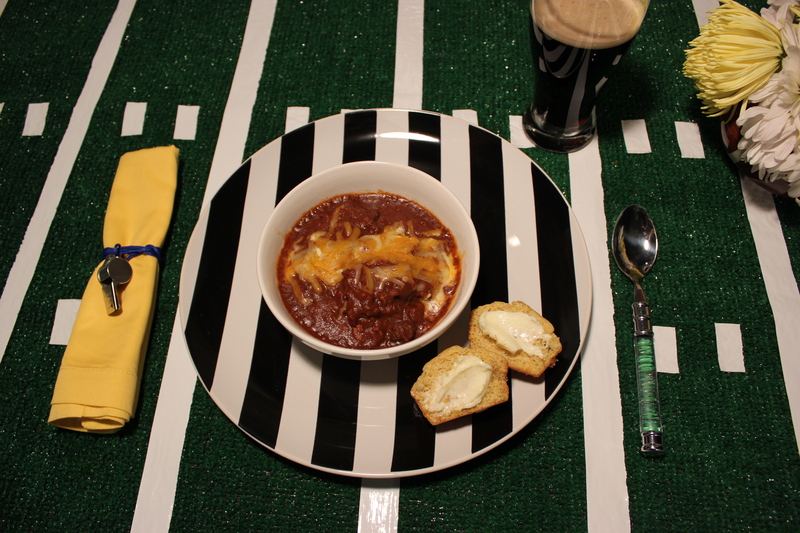 All that’s needed is lots of food, icy beverages and you’re all set for the Super Bowl.